Pata Yamaha Official WorldSBK rider and 39th “Coca-Cola Zero” Suzuka 8-Hours Endurance Road Race winner Alex Lowes joined Monster Yamaha Tech3 rider and fellow Suzuka teammate Pol Espargaró at the Automotodrom Brno this afternoon to experience the YZR-M1 during the official one-day IRTA test. Patiently waiting until the last hour of the day before he could sweep his leg over the 1000cc racing machine, the Briton confidently enjoyed his first laps on the premier class MotoGP bike. 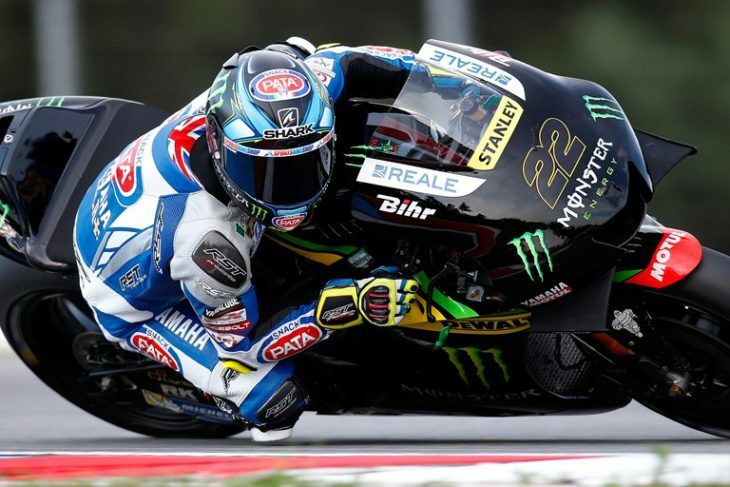 Reacquainting himself quickly with the Czech circuit, having not ridden there since he was 17 years old, Lowes soon got a feel for the power of the MotoGP YZR-M1 and improved his first hot lap by over a second when he set a fastest time of 1’59.558s. Clocking the twelfth fastest time and booking more than 1.146s improvement in just fifteen laps, the test unfortunately ended a little pre-maturely when Lowes suffered a small front end crash at the end of the session, but the WorldSBK rider nevertheless thoroughly enjoyed the experience. “Obviously this was one of the best days of my life! From when you’re a kid you dream about an opportunity to ride a MotoGP bike and it was fantastic. Obviously I didn’t do too many laps, but the feel of the bike was incredible. The power of the bike and the way that it turns was everything that I expected and even more than that, so it was an incredible experience. “I have to say a massive thank you to Yamaha for giving me this opportunity, it’s a dream for me. Also a massive thank you to the Monster Yamaha Tech3 team for giving me the opportunity as well and I’m so sorry for the crash, but honestly I really enjoyed the experience and it’s a day I will remember for the rest of my life. “The brakes and the tyres are quite a lot different from a WorldSBK bike, but the biggest difference is the power. When I came from my first lap onto the straight I felt the engine’s full power and it was amazing, I couldn’t believe how fast it was, so I would say the biggest difference is the power. “The crash was on my last couple of laps, nearly at the end of the day and obviously the reason was because I tried to push a bit too much without understanding everything. I broke a bit more and lifted the rear a bit, went a little wide and the track was a bit dirty and I lost he front. It was only a small crash but I’m feeling really sorry for that. Honestly, it was a fantastic experience and I really enjoyed it, even if I did only 15 laps, it were the best 15 laps I ever had. WSB Championship: Is Kawasaki Planning a Radical Superbike to Counter the Ducati Panigale V4 R?